Leith is where I worked as a ship’s agent a long time ago. Nowadays, the port is busy with North Sea oil support vessels, but it is also home to the Royal Yacht Britannia which was the purpose of my visit. 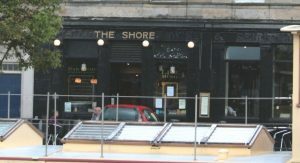 This elegant old ship has lain alongside Leith’s Ocean Terminal since 1998 having been decommissioned the previous year amidst much nostalgia and the shedding of Royal tears. And only yesterday did I get around to joining the tourists from around the world on board her. It was one of those situations when you know something’s on your doorstep so you never quite get around to doing it. Research prompted my visit. I wanted to get a feel for a ship like this. In Dark Ocean, the second Angus McKinnon novel I’m working on, a dilapidated old presidential yacht plays a big part in the story and I want to give it a character of its own. The contrast between the Britannia and my old tub couldn’t be stronger. The Britannia is immaculate and it was a pleasure to wander around soaking up her Royal atmosphere and history. 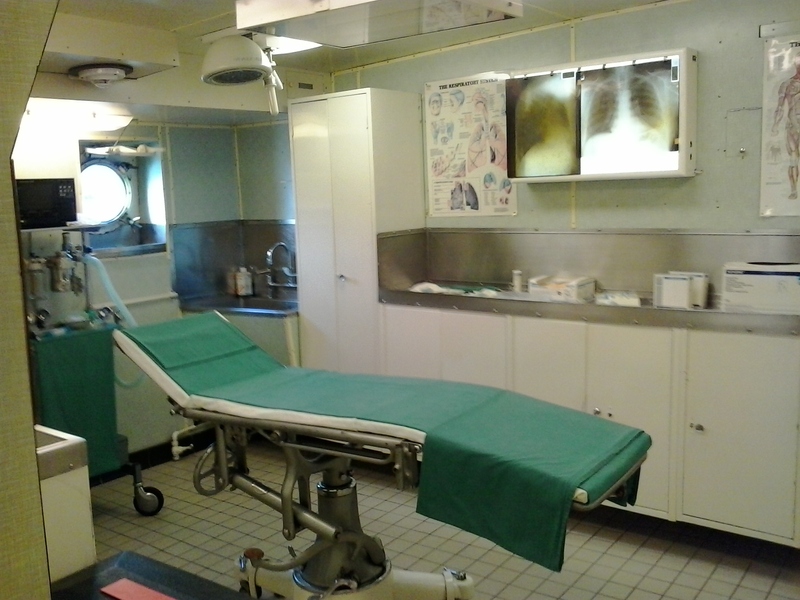 Even the ship’s hospital smells of surgical spirit. 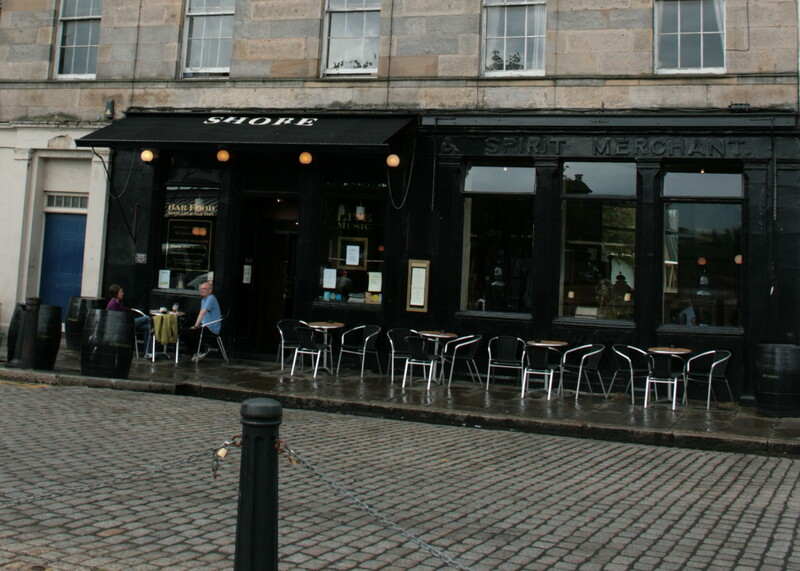 Then I walked back towards The Shore, a favourite pub of ours that featured in Sea of Gold. Between Ocean Terminal and The Shore you pass the Dazzle Ship, aka Windsor Castle and formerly the Northern Lighthouse Board’s Fingal. 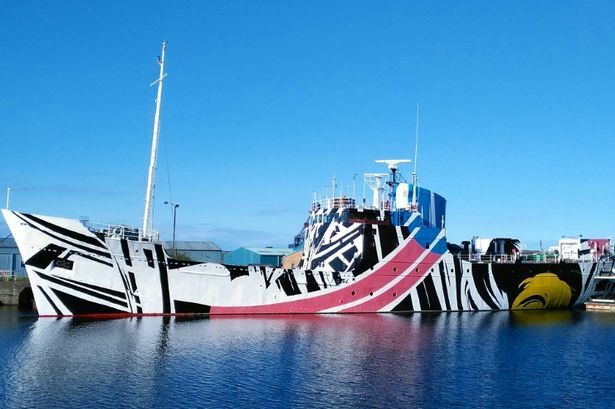 Dazzle camouflage was used in World War I. It made it difficult to estimate a target’s range, speed, and heading. 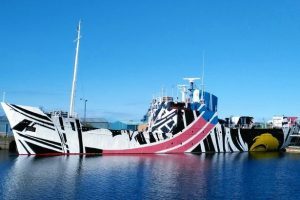 Whether you like the disorienting appearance of this giant work of art or not, she makes a striking site against the drab backdrop of the port. The Windsor Castle is owned by the Britannia Trust and is due to be converted into a 25 room boutique hotel by 2018. I doubt they’ll keep the colour scheme though.